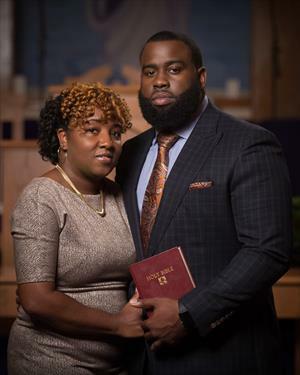 "Then the word of the Lord came unto me, saying, Before I formed thee in the belly I knew thee; and before thou camest forth out of the womb I sanctified thee, and I ordained thee...."
Pastor James Curtis Clark II (JJ) was born in Charlotte, NC and raised in Hartsville, SC by his parents, Patricia and James Clark. Being raised in the church, serving as a drummer, praise and worship leader and adjutant, Minister Clark knew that the call into ministring and preaching God's word was on his life from a youth. It was in February 2009 that he was anointed, consecrated and had hands laid on him, becoming a minister. Before being licensed, he was covered under the leadership of the late, great Elder Nero Benjamin (grandfather) and the late,Bishop Charles Mcdowell (spiritual grandfather), who took him in as a son and revealed to him, the principles of God. He was also mentored by Bishop Jackson who laid hands on him to affirm and confirm what God was doing in him. Minister Clark serves faithfully under the leadership of his spiritual father, who is his pastor in the person of Bishop Michael A. Blue and Pastor Malinda Blue, establishmentarian of the Door of Hope Christian Church. Faithful to God, and faithful to the local ministry, Minister Clark believes that promotion doesn't come from the east or the west. Promotion comes from God. Pastor James C. Clark II now serves as senior leader of Wayside Chapel Baptist Church. He is the husband of one wife, Chante Clark. They have two anointed children, Moneesha and Jaylen Clark. He has a passion to see people give their lives to Christ and walk in the full manifestation of God's purpose on their lives. He lives and believes Philippians 1:6, "Being confident of this very thing, that he which hath begun a good work in you will perform it until the day of Jesus Christ:"